If you attend, you can join our Panel Discussion at the head table and conduct your Telephone Town Hall Meeting "live" from the event. I am inviting all of District 27, Democrats, Republicans, Libertarians and Independents. All U.S. Citizens are invited to attend this free and open event. We will not allow shouting or disrespectful behavior and no signs will be permitted in the hall. 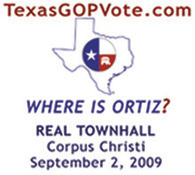 I was informed that you came to Corpus Christi on Tuesday August 25, 2009 for a ground breaking at the Corpus Christi International Airport. I trust that you will also attend ths Town Hall event in person, to let your constituents voice their concerns. This Health Care Debate affects every single American and deserves your personal attention. To make arrangements or ask questions, please contact me.